Unfortunately this book is no longer available. You can download it as a PDF - please refer to the IBExpert documentation for further information. FINALLY A PUBLICATION DEDICATED TO THE OPEN SOURCE DATABASE, FIREBIRD™, USING THE POPULAR GUI TOOL, IBEXPERT. 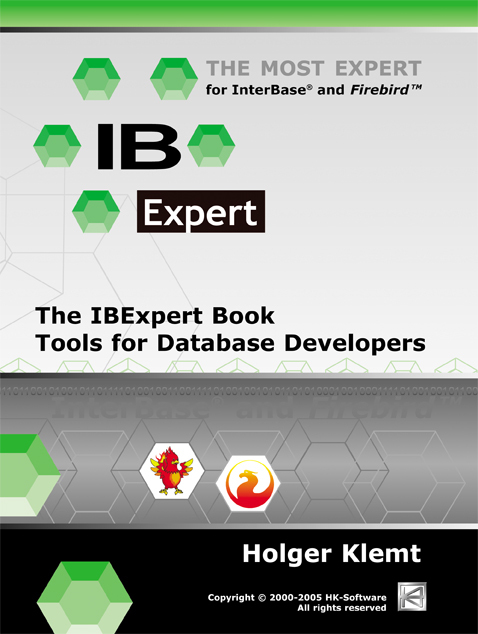 "The IBExpert Book - Tools for Database Developers" tackles this extensive subject comprehensively, making it clear enough for even the novice to understand. Oldenburg, Germany - August, 2006. Whether developing professionally or as a hobby, this comprehensive reference work offers something for everyone. The Firebird™ server is an extremely powerful open source database system, which in spite of its very simple installation and administration, offers all essential functions otherwise found only in commercial database systems such as Oracle® or Informix®. However, Firebird™ currently provides the user with but a few command-line tools; there is no powerful GUI tool for data definition and administration included in the kit. This, along with the limited documentation, is the first hurdle that Firebird™ users, in particular newcomers, need to overcome. IBExpert has established itself over the past few years in the Firebird™/InterBase® scene as the most comprehensive GUI tool on the market. The decision to publish a book at all was made, according to Holger Klemt, the author and himself a commercial database developer, because, "even though the trend has continually developed in the direction of electronic media, the value of a book for a novice to such complex technologies, as a compact collation of information, should not be underestimated - now or in the future. Our regular Roadshows and the direct response from our customers have consistently shown that many functions and features, explained clearly and in great detail in our online documentation, have simply never been "discovered" by the user." The book is clearly structured and provides a step-by-step detailed guide covering all aspects of database development and administration: development of database objects, database models, stored procedure and trigger programming, performance tuning; in fact, all resources required by a user to acquire the technical proficiency essential for professional applications. All relevant modules are presented in detail and the sundry options, background information and source code examples provide both beginners and experts alike with a wealth of information that can only otherwise be laboriously compiled from diverse information sources. Not only a "How-To" guide, it also offers fundamental database theory, recommendations and detailed solutions in all vital practical areas. The more experienced developers will discover features and solutions that have previously been overlooked, or just not obvious. It is well-illustrated and written in an English that is comprehensible even for non-native speakers. It also includes articles about specific Firebird™ issues, kindly contributed by acclaimed Firebird™ authorities, such as Paul Beach, President of the Firebird™ Foundation, and Ann Harrison, who has been involved with InterBase® since the 1980s, both of IBPhoenix. Following the success of open source operating systems, particularly in the area of server installations, the database market segment is now also on the brink of such a breakthrough. Firebird™ is here certainly one of the most powerful platforms, and IBExpert the ideal complement for discerning database developers and administrators. If you´re looking for a way to make life easier, this publication will certainly help you on your way!